Today we published more than 30,000 images from the Getty Museum’s collection on Getty.edu using IIIF. 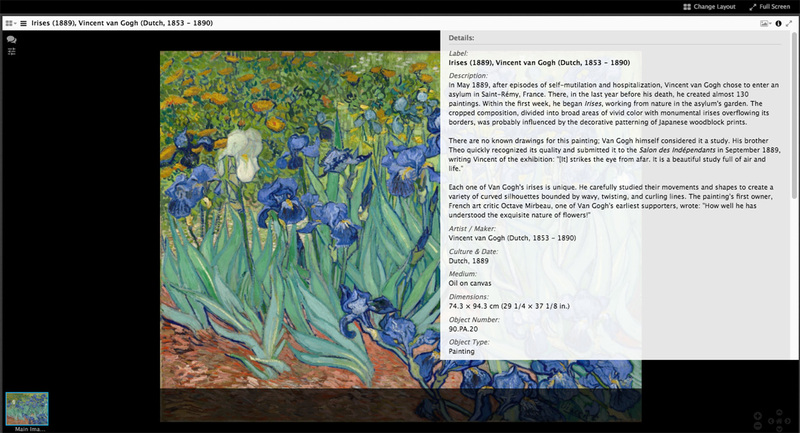 You can see and click on the red-and-blue logo underneath the main image of any of the Museum collections, such as Van Gogh’s Irises, to explore our content through any IIIF-compatible viewer. We’re happy to join another IIIF partner, the Yale Center for British Art, which is also releasing images as IIIF today—you can read their announcement here and browse their collection here. IIIF (pronounced “triple eye eff”) is the acronym for the International Image Interoperability Framework. This framework comes from a broad community of primarily cultural heritage organizations that are working together to come to practical consensus around the publishing of digital images. By adopting the framework, the public as well as scholars can bring together images from any of the participating organizations for comparison, manipulation, and annotation in a single user interface. This community has agreed upon, published, and implemented two major specifications. Representing the Getty in this community, and working toward implementation of IIIF here, has been one of my major roles since joining the Getty as semantic architect. The images now available via IIIF are from the Open Content Program. These were selected as the first tranche of content, as the rights have already been cleared to make them openly available. Any new images added to the Open Content set will automatically be available via IIIF, and images from Getty Research Institute collections are expected to be available before the end of the year. 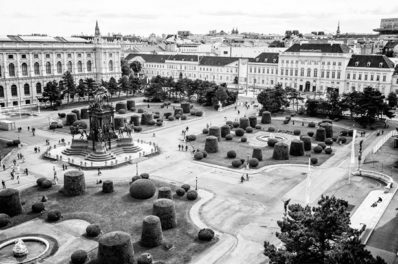 The Getty Museum has published an implementation of both the Image and Presentation APIs on its online collection. The Image API gives access to the images’ pixels, enabling the smooth and deep zoom you’ll experience in the Mirador client, along with technical information about the image such as its dimensions and available formats. The Presentation API gives the rest of the information you’ll see—the title of the object and all of its metadata, rights information, and, if there is more than one image, the order in which to display them. The implementation was carried out primarily by Daniel Sissman, the Museum’s software architect, over the course of only two afternoons! I was mostly there to answer questions and provide advice from other implementation experience. The work revolved around extending the existing capabilities of the Digital Object Repository (DOR) to produce a different JSON syntax for the descriptions, and figuring out how to translate between IIIF requests and the existing image tiles used in the current collections web interface. The DOR is an access layer on top of our collection management system, TMS, to provide the content in more usable, read-only formats. The IIIF Presentation API is very complete—so complete, in fact, that its functionality is beginning to outstrip the capacity of current viewer implementations. All of the information available on the Museum’s collections pages is also included in the description of the object, plus access to all of the “alternate” images for the object, including different views of sculptures or the various digitized folios for manuscripts. The viewer that appears when you click the IIIF icon is called Mirador. We chose Mirador because it allows comparison of multiple objects—a key scholarly use case—and will support annotation of the images when we add the infrastructure to manage the annotations created. Select an artwork from the Getty Museum online collection that has a IIIF icon (just below the image and to the right). Click the IIIF icon to open the Mirador viewer. Select “Change Layout” at the top right to add one or more slots where you’d like additional artwork images to display. Select another artwork (with an IIIF icon) that you’d like to compare. Go to the webpage for this object and drag the IIIF icon from that browser tab or window into the new slot you’ve just created. The two images will now appear side by side. 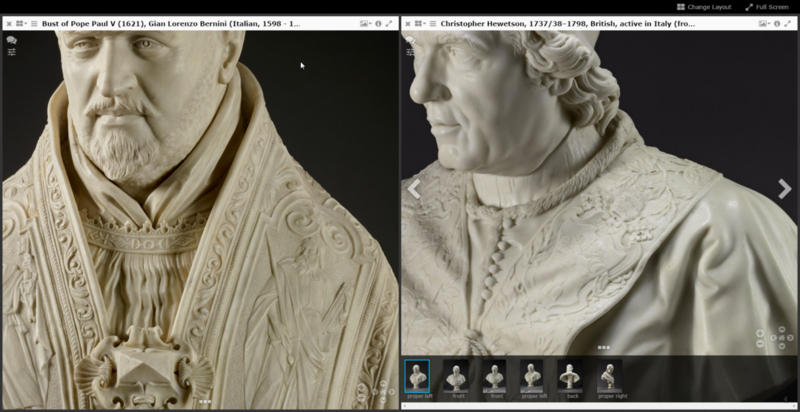 This will work to compare objects within the Getty Museum collection, but also objects held by other institutions that enable IIIF functionality, such as the Yale Center for British Art. For example, you might want to compare Turner’s depiction of stormy seas in the Getty’s Van Tromp Going about to Please His Masters and with the Yale Center for British Art’s Stormy Sea Breaking on a Shore. 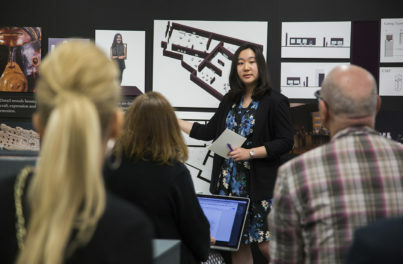 As Rich Fagen, our chief digital officer, says in the press release about the adoption of IIIF at the Getty, “we are excited to help digital arts scholarship reach this next frontier.” We also look forward to sharing our progress with the IIIF community, which is meeting at the Vatican next week. Several Getty staff will be presenting, including Daniel, as well as speakers from the Getty Research Institute and Getty Digital. Next steps in our adoption are already under way, and focus on improving the consistency and functionality of our implementations across the organization. The Museum implementation of the IIIF Image API is sufficient to implement the core pan and zoom functionality, though it doesn’t currently support rotation, mirroring, or arbitrary regions. This will be supported in the future through the use of an image server developed by Princeton University, which will become a core infrastructure component providing access to content from across the programs. An implementation of a third IIIF API, one for coordinating authentication of users, is being developed to allow differentiation between anonymous requests, known scholars, on-site researchers and staff to allow as much access to the content as we are legally allowed to provide. I’m happy to answer questions about the Getty’s use of IIIF. Feel free to leave a comment here or contact me by email or Twitter. General questions about IIIF should be brought to the community’s forum (iiif-discuss@googlegroups.com). Ahh the perfect use of twitter to spread the message of lllf and the Getty collection. Getty should be more than proud of this valuable step forward to enable even more focus on great art awareness. Comparing great master’s paintings is obviously a very valuable and progressive step toward increasing the skills of serious artists as well as sharpening the understanding and appreciation of all great art for every educated art lover. For me it’s a thrilling and revolutionary accomplishment that will further inspire my own work! Thanks so much! Michael at MichaelsPaintSplash.com. Thanks Michael! We are very happy to have gotten this far, and look forwards to improving the offering with more content from across the organization. 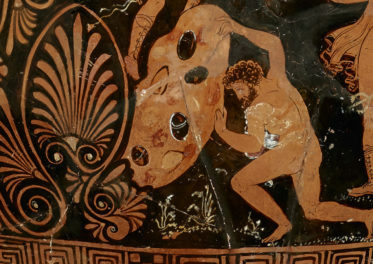 Nice work Getty Museum and to be honest I had no idea about IIIF before reading this article. Appreciate their works and waiting for the next project. Hope that they keep continue that kind of innovating works.